Located on the North Sea coast around 5,000 people call this small fishing and tourist town home. land and now it is like it has always been part of the mainland. Dyke walkway along the North Sea. Exposed as it is to the North Sea flooding and storm tides continued to be a major problem, but since 1825, an improved dike system has sorted that out. A “storm tide” is a non-scientific term for “the rise of water associated with the storm, plus tide, wave run-up, and freshwater flooding” (Wikipedia). The scientific meteorological term is “storm surge”. The first documented mention of Büsum (as an island) is in 1140. Despite being fairly small, insignificant and out-of-the way it had its share of being acquired by others. In fact from 1559-1867 it was Danish territory and later became part of Prussia. I tend to forget that Germany as Germany is actually a “new” country. Prior to 1871 it consisted mainly of Bavaria and the many states eventually known as Prussia. Then there was the division after WWII into two Germanys and only since 1990 with the reunification of the two has the “German Question” finally been resolved. The “German Question”, as I understand it, basically being what the heck was Germany way back when. That’s not to say that Germany is only 20 years old, that WWII thing was a blip, even so as a country it is a young whippersnapper. Büsum was a poor island before shrimp fishing became viable in the 1600s. To make ends meet, so to speak, the residents often took up piracy and their favourite target was Hamburg. Hamburg even then was a large trading/shipping port and all those ships filled with goods were just too tempting to pass up. Of course Hamburgers (that is what they are called. I’d like to live in Hamburg just so I could call myself a Hamburger) would retaliate and usually won. These days as a tourist town it is mostly people from Hamburg that come to enjoy the sea air and beaches at Büsum and, I’m sure with the inflated prices that seem to go hand in hand with tourist towns, Büsum is getting its own back now. 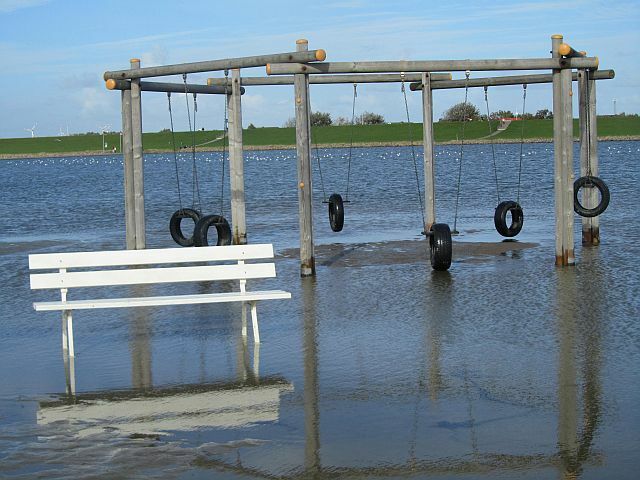 Playground - tide coming in. Fishing and shipbuilding have declined and over the last one hundred years or so tourism has gradually taken over as the main industry. People have come since 1818 for the healing benefits of the seawater and mudflats of the Wadden Sea (an intertidal zone in the south-eastern part of the North Sea). In 1949 Büsum was officially named a Nordseeheilbad (North Sea Health Spa). 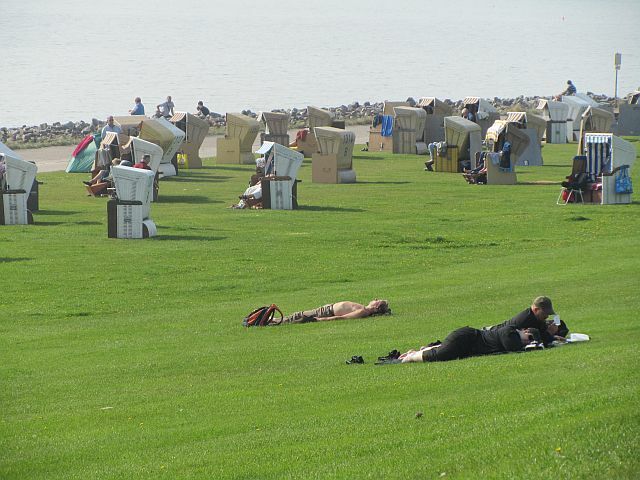 Although Büsum is a popular summer vacation spot nearly all of its tourists (99.5%) are Germans, most from Hamburg. 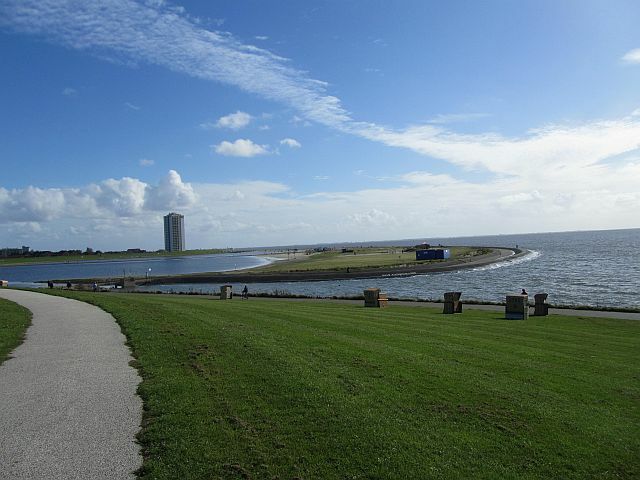 Popular tourist activities in and around Büsum, besides lounging around on the beach, include boat tours – especially for wildlife viewing, fishing, kite flying, going to Helgoland (an island nearby), or mudflat hiking of the Wadden Sea. Mudflat hiking is a fun pastime for people who live in areas that lend itself to that (well, I suppose you could go even if you didn’t live in those areas) – such as the Netherlands, and the low-lying sea areas of Germany and Denmark. Basically at low tide you wade and walk on the mudflats. 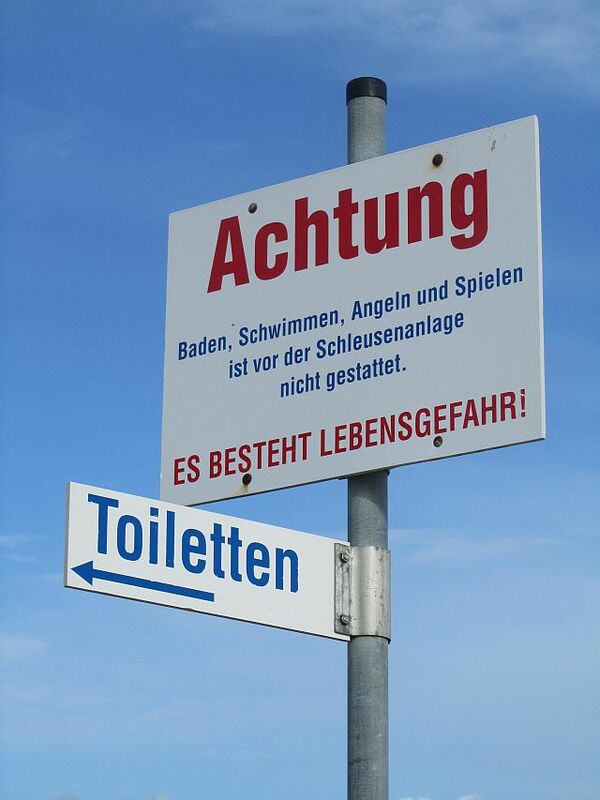 However, on/in the Wadden Sea National Parks you are only allowed to do this with a licensed guide. Tides are pretty regular but if you don’t know what you are doing you can find yourself in deep do do pretty fast – as in how long can you tread water? Germany, Netherlands and Denmark are working together to protect and conserve the Wadden Sea National Parks famous for its rich flora and fauna. In 2009, the German and Dutch parts were included on the UNESCO list. Dusseldorf and the Rhine before, but never to the north. Flat, very flat, and windy, likely because of that there are dozens of windräder (wind turbines) around. It was a long way to Büsum from Altendiez even with the ICE for most of the journey. If I remember rightly – with stops and transfers (yes, you can actually wait more than 5 minutes for a connecting train) it took almost 9 hours. I did enjoy the journey, but was quite weary when I finally got to Büsum. Strange how you can get tired of sitting. 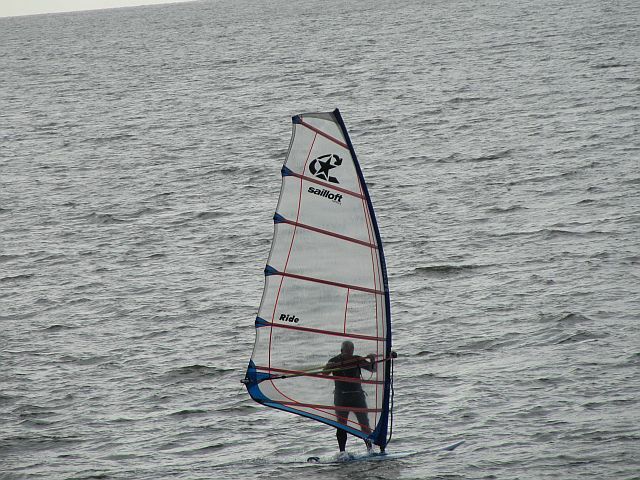 Intrepid windsurfer on the North Sea. The town was quite different from what I had gotten used to seeing. As a consequence of repeated flooding there are no medieval buildings and no old town centre. Instead of stone the buildings are all of red brick. I also saw one house with a thatched roof. 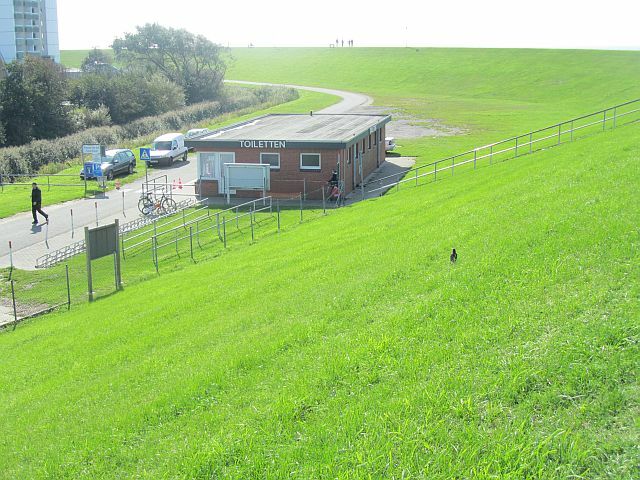 An extensive dike runs between the town and the North Sea, and to help keep up the dike every overnighting visitor pays a Kurtaxe (Resort Tax) – cost me 15 Euro for 5 nights. For that you get a Kurcard which gives you free entry or reduced rates on some attractions. For instance it gave me “free” entry to the dike and beach (you actually can’t get to the beach without going over the dike) otherwise every time you want to walk the dike/beach you pay for the privilege, visitor or not. I walked up and down that dike a fair bit as it is also a straightforward shortcut into town. This Kurtaxe was something that I had not encountered before, apparently it is usually charged by sea-coast resort and spa towns so you can use the beaches. I don’t recall being charged it anywhere else, although having said that I have a vague recollection of paying some extra fee on the Oberammergau hotel bill (figures). Dyke entrance - pay your fee here. scrumptious. The dike is fairly extensive and a good walk and the beach is plentiful for catching rays. There is a protected area for swimming but it is pretty shallow although good for kids. If you want to swim in the North Sea you generally have to go down some concrete steps for ease of access as the shoreline is mainly unwelcoming tumbled boulders. trip out. One was seeing one of the original steam trains. It is the 175th year of train travel in Germany and I was lucky enough to be in Neumünster (for a connection) when an old train came through. Filled with happy people (current or retired train industry people, I believe) waving and grinning at folks waiting on the platforms, I was too busy waving and grinning along with everyone else to remember to take a photo. The other gratitude was having booked a reserved seat. It was a Sunday, and a lot of people were going home after a weekend away. In Hamburg we took on so many people that it was a real crush – folks trying to move along the aisle from both directions looking for their reserved seats or just an empty seat. Their efforts were not made any easier by trying to manoeuvre suitcases through as well. Tempers were barely held in check and I think in the end a fair number just gave up and remained standing in the aisle, which of course, added another dimension of jocularity when someone needed to get off the train. One of the many warning signs.